Update: All the free books I put out evaporated. And I have a request for another copy of Human 76. I hope everyone enjoys them! First of all, I know I'm not getting these out on the same day as the events took place, but I really do need to get at least 5 hours of sleep. When you're at Shore Leave, the day starts at 7:00 am and often goes until midnight. And when it's over, you're still a little tired. Okay, a lot tired. But I'll try to post as much as I can (and hopefully better than last year) as soon as I can! Things really got going on Saturday. Lots of discussion panels, lots of talks by actors, and lots of authors pushing their books. Let’s talk about the final season, what we wanted to see and didn’t, and what the future is for the Grimm universe. Marvel Women Warriors: Ultimate Face-off! work the way others do. What have our panelists learned from this experience? revision into refinement rather than replacement? Is the return of Indiana Jones, to be played one more time by aging but sturdy Harrison Ford, a good idea — or a bad one? Star Wars changed everything, including how we look at sci-fi costumes. How has this influenced other sci-fi? How has this changed costume fandom? What does the future hold? Outlander: From Book Shelves to STARZ! Loving this series and speculating about what might come next! Writers often experience conflicts between their writing and their family and job obligations. Can one use such conflicts productively? How does one build a firewall between work and the rest of life? Lots of SF/F stories explicitly use historical models, whether it’s the Victorian Age for steampunk or Age of Sail for original Star Trek. What pieces of the past are best for borrowing? How important is accuracy? Too much style for one gender? Stephanie Kiss transforms a young man into a young woman. Learn how it’s done! Have I ever danced with the devil in the pale moonlight? If you’re a fan of the devil, let’s talk about what’s in store for heaven’s fallen favorite son. Does Fiction Go Too Easy on Evil? doing society a disservice by giving evil a good name? What are the Starfleet Marines? Join us to learn about this active branch of Starfleet! Where do they intersect, and how has one affected the other? You are invited to attend a formal changing of the guard within the Royal Manticoran Navy. With a new movie opening, the franchise approaching its 50th anniversary, and new books and comics coming out, what is it about those damn, dirty apes that keeps us coming back? And what lies ahead? Star Wars at 40: Wow, Do I Feel Old! Exploring our history with Star Wars! Deanna Troi, I Feel You! So You Want to Be a Dealer? How do you start? What do you need? How do you achieve success? LGBTQ+ in Media: One Step Forward, Two Steps Back! Secret Disney stereotypes and the ships that never sailed. The “walkers” faced their deadliest threat in Season 7. What did you think of this season, and what do you hope will happen during Season 8? Discussion of the events of the most recent Steven Bomb. role and portrayal of women in the science fiction genre. Sixteen of the most acclaimed hand-to-hand combatants in Marvel are squaring off for you to choose who is the greatest Marvel warrior! they’ve met and the experiences they’ve had along the way. Do we have the right to either hunt for Bigfoot or kill one for research? Does science fiction have a responsibility to be a commentary on our times? Six years ago at Shore Leave, a group of writers decided to write what they wanted and publish it themselves. What have they learned since? What’s coming next? And why must Glenn Hauman die? What would you like to see in this program’s third season? Into the Badlands: So Good to Be Bad! Into the Badlands just finished its second season with a burgeoning fan base in withdrawal a year away from what comes next! Big Bang Theory: Sheldon Proposes!?! Do you think they’ll ever make it to the altar? Women Don’t Write Genre Fiction! Wait, WHAT?? The numbers need to improve and the acknowledgement to increase, but why is that erroneous assertion so easily and commonly accepted? And is it worse in genre, or typical of all publishing except romance? What is it about this 78-year-old character that continues to be embraced by fans of all ages? Join us as we delve into the mythos and the man behind the cowl. Firebringer Press authors chat up their current books as well as upcoming releases. Debut author Diane Lee Baron will launch her novel, Gal Wonder, at Shore Leave. Time permitting, there may be readings. What do writers do if, halfway through writing a novel, they lose faith in it? How do writers recover enthusiasm for what they think is a flawed work? Trash it or fix it? A preview of forthcoming Star Trek novels from Simon & Schuster, with some of their authors as well as other Trek-related titles due out this fall and into 2018. Marvel/DC Warriors: Ultimate Face-off Finale! Its time for the final votes to be cast, comrades! Time to decide the Ultimate Warrior! Choose your champions, and let the Ultimate Face-off Finale begin! I attended the three marked in red. The day started with an over-indulgent breakfast, as usual. 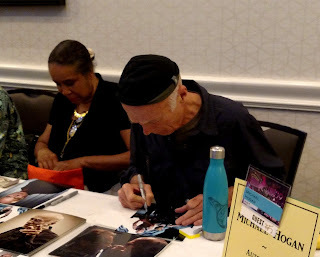 Once my group had stuffed as much into our bellies as was humanly possible (we don't do lunch at Shore Leave—there isn't time), we waddled out to the autograph line to see who was available and weren't disappointed. We were able to get a number of pictures signed before the day's activities commenced. I went to the panel titled Your Writing or Your Life and then it was time for my photo with Marina Sirtis (Counselor Troi, from Star Trek) and Michael Dorn (Worf, from Star Trek). I'll have a scan of it posted here eventually. After getting the photo taken, I attended the Defending the Lighter Side (most of it) and The Art of Secondary Characters panels. I'll have more on the panels later. If I put it all here the blog posts may approach novella length. After sitting in the same spot for almost two hours listening to the discussions, I was ready for a break. I went to the pick-up area near the Hunt Room to get my photo-op picture. Autographs will be done on Sunday if all goes as planned. At 3:00 pm it was time for the Marina Sirtis and Michael Dorn talk held in the main convention rooms. Unfortunately, I was sitting too far back to get any good pictures. There were quite a number of interesting and amusing stories from both, though Michael Dorn is definitely the quieter of the two. Although these two were the guests I was most familiar with, I can't say I knew much about them. I certainly wasn't prepared for Marina's cockney accent. One young girl taking theatre in college asked if they had any tips on getting started in acting. Marina Sirtis told her to go to New York and get into actual stage acting. She said it is the best place to learn and get experience, and that could give her an edge as many actors and actresses have never set foot on a real stage. Michael Dorn related stories about his interest in flying and his experiences with the military after being invited by many of the services to help them with publicity. His reward was often a flight in a jet fighter or with a team like the Blue Angels or the Thunderbirds. Finally, it was time for dinner. The food at the Hunt Valley Inn is still excellent and I ate way—or is it weigh—too much again this year. After dinner, we went back to our rooms to rest up a bit until the masquerade started. We ended up resting a little more than planned, but we did get to see the winners! The plastic orange things they're holding are their trophies. I guess it's nice they got something, but it wasn't much of a trophy... By the way, the Willie Wonka guy (second image) really looked like Gene Wilder. Some of the people won in multiple categories, so they were on stage more than once. 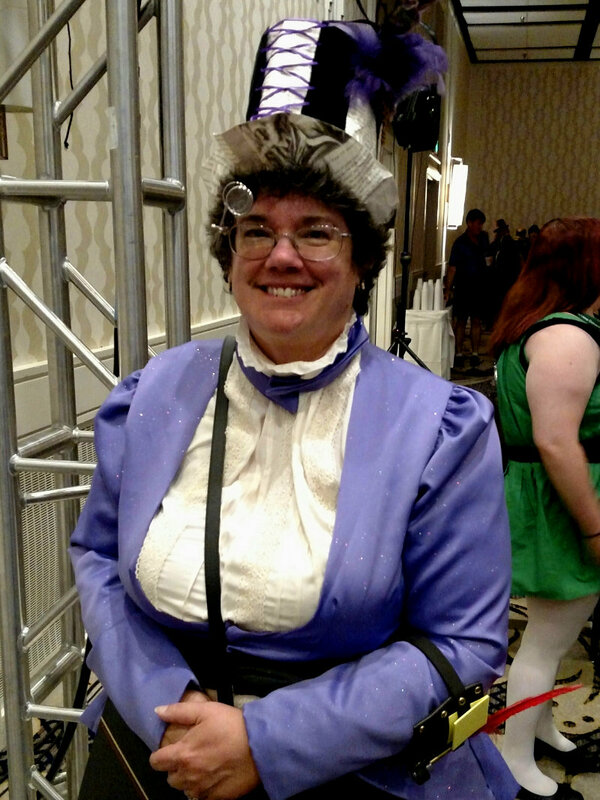 This young lady won the "Best in Show" for her steampunk librarian! Best in show - Steampunk Librarian! Ah, you should have! My eldest is still working out who he wants to be at a Dutch ComicCon in November! Wow, I would not have expected a cockney accent either. Like when I first hear Rose Lesie (Ygritt - Game of Thrones) speak, she has a really posh English accent, not a Northern English accent at all. It was odd. It was funny. Sounds like you had fun though, that's the most important thing. It's been over half a century since I last wore a costume, and since I'm not familiar with 99% of the TV shows, books, and movies (I hear they're in color and have sound now), I'd really have a hard time picking out a character to portray! Some folks had really nice - and intricate - costumes at Shore Leave, many of which were hand made. Except for characters like Spok or a Klingon, I didn't know who/what most were supposed to be. Marie knows all that stuff, so I rely on her to fill me in. Marina said she tried sounding posh, but decided to go back to speaking like herself when not in an acting role. It's always interesting at Shore Leave and I'll have more blog posts about it in the coming days (or weeks, the pace I go...). I attended several panels that you might have enjoyed, and romance writing was brought up more than once even though it is a sci-fi convention. BTW, I was wondering if the copy of Outside the Lines I set out would be picked up as quickly as the other books. Basically, I turned my back and it was gone. People were even checking to see if any more books were available. So it appears sci-fi folks enjoy a little romance, too! Shore Leave 39 And Free Books!